So this week is Super Doubles at Harris Teeter! For those of you who don't know what that means...it means Harris Teeter will double all coupons $2.00 and less! So if you have a $2.00 coupon for something you could save $4.00 on that item! They use to only double coupons $1.99 and less but they have recently changed their rules! We are on this new budget by Dave Ramsey so honestly the last couple of times Harris Teeter has had triple coupons or super doubles I have barely shopped. It has always fell at the end of a month when our grocery funds were low. I knew we had everything we needed to eat and I would have been going to just stock up on some things we would use later on! But now a few of our stock piles are getting low and some of the deals this week are just TOO good to pass up! I know some of you would debate with me about other grocery stores being cheaper! And I would never tell you Harris Teeter is the cheapest grocery store around! It is most likely the MOST expensive store around but I think Lowes Foods is pretty darn expensive as well! :) But I got all of these items pictured for $13 and some odd change! THIRTEEN DOLLARS!!!! My bill was $64.00 with my Vic Card and then I gave the lady 18 coupons and my bill was $13.00!!!!! We use laundry detergent, soap, milk, butter, shave gel, feminine products, baby snacks, and baby food now that we have an 8 month old! So YES it will all get used! * All Laundry Detergent - on sale for $3.99 and I had a $1.00 coupon that doubled so they were each $2.00! So do I ALWAYS shop at Harris Teeter NO! Honestly one of my new favorite places to grocery shop is Kroger in Garner! Their prices lately have been great! But during Super Doubles you bet I will be at Harris Teeter multiple times this week! Ziploc bags, more baby snacks, and other items are on the list to check out! And all this to say...try couponing at least for weeks like this! I know it takes time and is hard to keep organized at times! But give it a try and then all the money you save use to pay off debt, give to a good cause or use it to do something nice for someone you love! Do they take other store coupons as well or just manufacturer coupons? Good job Mandy!!! 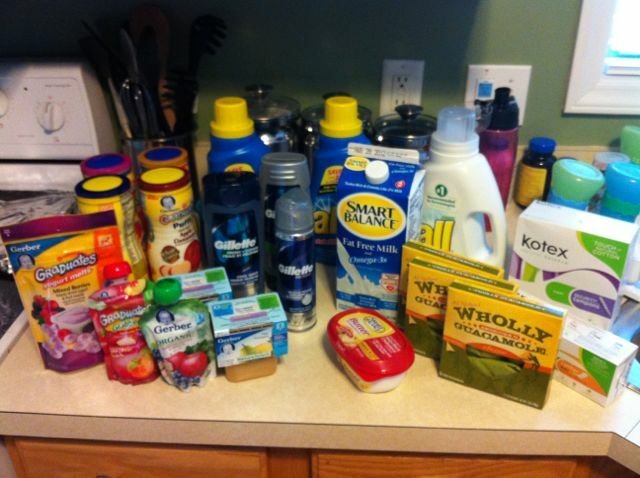 Couponing does take a little extra time but it is so worth it and can save you a ton of money! We would not be able to stay on our budget if I didn't coupon. The money you save you can put towards something else!! I just love it!!! Miss you girl!